Not only does a watch serve as a handy tool for timing, it’s also a kind of accessory today, whose luxury and stylishness might amplify wearer’s image. The very fundamental aspect of every wrist-watch is incredibly simple, so that both one dollar-worth and more expensive scions of this class can handle this function. It might seem that the major drop in watch production costs, occurred in the 80s of the twentieth centaury and caused by a leap up in microelectronics, would ruin the traditional market of these mechanisms; however nothing like this has happened so far. Even nowadays, your arm will grab everyone’s attention if you have mechanic or quartz watch, boasting original design created by a known manufacturer, better a Swiss one. 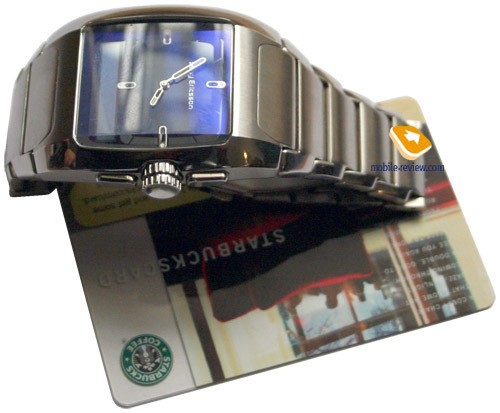 Basically, such image of a watch has been established with the help of billions, invested by companies in one or another form – through direct advertising and making up a subtle halo around their products. This market should be closely investigated mainly by handsets manufacturers, as soon they are going to encounter more or less the same situation. By “soon” here we mean “in 20-25 years’ time”. 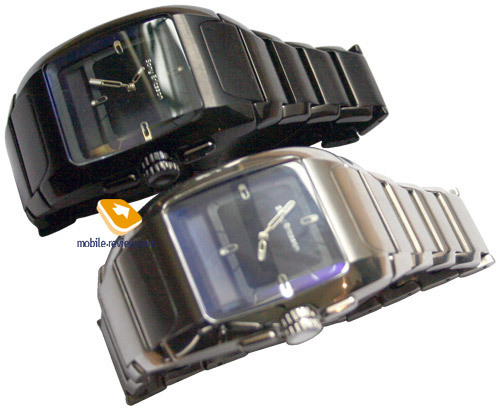 When I was still in primary school, the market got flooded with digital watches owing mainly to Japanese manufacturers. Since I was a bit too young back then, I cannot surmise how successful such watches were world-wide, but the thing for sure is that for majority of my classmates those were beyond wildest dreams. Having gotten Casio-labeled watch (with 16 various tunes, stopwatch, and all this in an extremely slim casing) as a birthday present from my father, I was more than just happy. For a third-form boy such watch served for both entertainment and timing purposes. We played “99” with it (when one must catch milliseconds with the stopwatch) and did countless other things. Some had watches with built-in FM-receiver (in the USSR they were useless) or calculator. 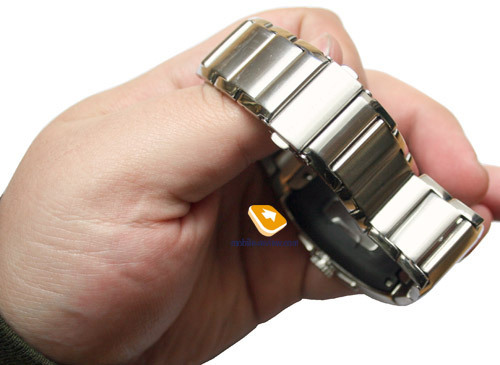 A couple of years later, we got bored with such gadgets, so that in secondary school we had ordinary watches on our hands, frequently mechanical ones. That is how digital watches have gone out of fashion. As accessories, watches do their best – having created something unique with watch concept inside, you won't hit star-high sales, but certainly will attract masses’ and journalists' attention. 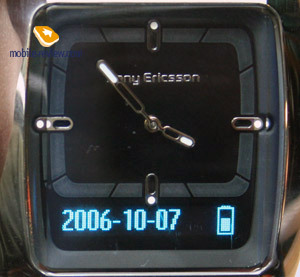 Apparently, it is the very idea that was driving Sony Ericsson when it got to developing Vanguard watch. Being the pioneer innovator of Bluetooth technology, they company tries to live up to this image by coming up with various gadgets – just remember the toy-car and the furor it created on the market. There are three buttons mounted on the casing, namely two big ones on each side of the clock winder and the clock winder itself, since it can be pressed as well. 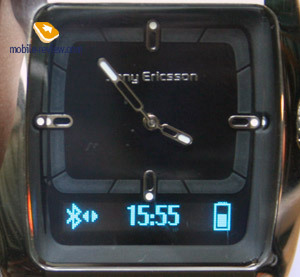 The analogue watch face with two hands tops the display that stays inactive unless an event occurs. 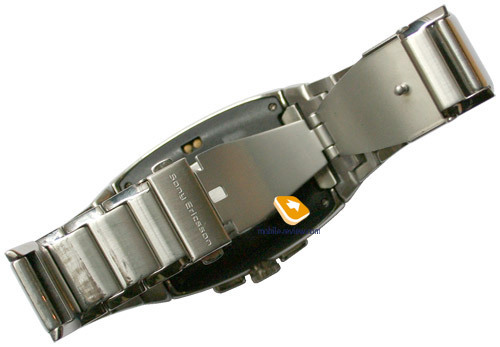 Although it can be brought to life with the upper key, so that it will get filled up with date, time and battery status. The lower buttons calls up the menu featuring the following options: Bluetooth activation, coupling mode, SMS notification (on/off), time synchronization with handset. The MBW-100 is quite bulky indeed, as it tips the scales at massive 182 grams, which is too much in the judgment of most users, nevertheless youth won’t find much of an impediment in this – eventually, you get used to carrying a watch on hand. The water-proof (up to 30 meters) casing is made of stainless steel, but due to the inner side housing charger contacts, I wouldn’t recommend swimming with the MBW-100 being on you. The hands are covered with phosphorescent powder, thus they remain visible even in the darkest rooms. On top of that the display (if activated) can tell you time as well, which is quite handy. Here I must make an important note – this watch goes with Sony Ericsson-branded handsets only with auto pairing being supported. Coupling the MBW-100 with Nokia’s phone won’t cause much problems, however not a single feature will start up. 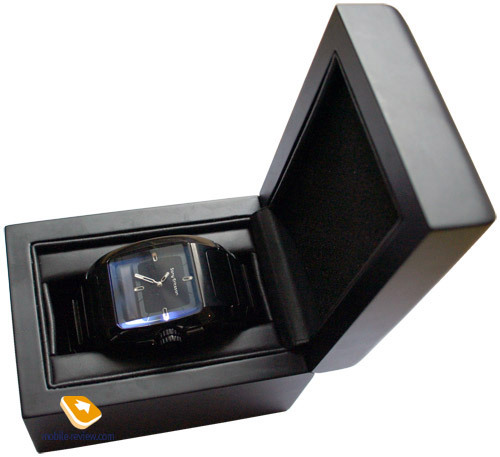 The MBW-100 comes in a stylish black-finished box – inside you will find either silver or black colored watch. It would seem that the black trim is more appealing visually, though it’s not the whole truth – the steel trim has its trumps as well, since it has somewhat fresh looks. After a week of use I had twofold impressions – while dimensions and weight are not that crucial for teenagers, other features do matter. For example, when bending hand, you might accidentally push the winder and thus start music playback – it’s not a real issue, should you have handset in shirt’s pocket, or headset plugged in, in this case you will notice that and turn the player off. But if the phone is carried in a purse or bag, it will most likely have lost the lion's share of its charge before you realize that. While out of coverage zone, the watch notifies you that the connection is lost with vibration. Such feature seem to be out of place to some extent – in the beginning you keep twitching, when moving around flat, and then come to ignore these signals. It won’t make your phone thief-proof either – when moving in a crowd, a thief will be at least 5-6 meters away, so you will hardly see him. The great thing about the MBW-100 is Caller ID in display – such seemingly unsophisticated feature comes in handy owing to numerous reasons. For instance, when at conference or talks, it’s not always polite to get a handset out of pocket and decline a call, but everything changes with Sony Ericsson’s latest innovation – you can quietly (everything is relative in this world) check out who wants to reach you so badly. Unfortunately the target audience won’t make much use of this particular function – it will rather be just for show only. Using the top key you can mute incoming calls (both on the watch and the handset), double press declines a call. The dedicated player controls found on the MBW-100 are good only for Play and Pause commands, since in order to jump to other tracks you will need to press the winder and turn it at once. Taking account of how big the watch is, it is not always handy. The MBW-100 doesn’t provide any information on currently played back track. The built-in battery, as the manufacturer claims, can last 7 days, but in our case the watch managed to stay online for not more than 2 days. Considerable number of calls reduces lifetime dramatically – at 20-25 calls a day, the MBW-100’s charge will go off in a day’s time. On weekends the lifetime turned out to be twice as long. On the other hand, paired watch, worn as a trinket might work for 7 days indeed. 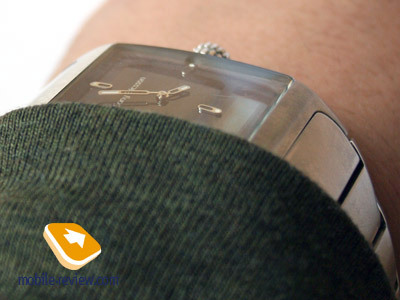 One of the most troublesome aspects lies in the fact that should the battery run out of charge, the analogue watch stop as well – the hands just freeze. After recharging the battery, you will have to set time all over again, for the MBW-100 lacks auto time set feature. 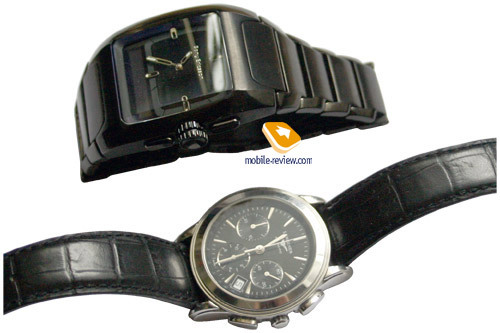 Another shortcoming is that frequently the watch sets time on handset on its own and we couldn’t figure out why. 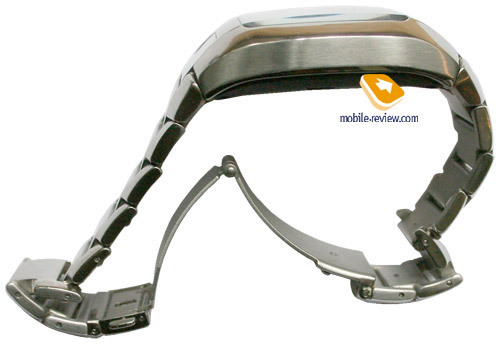 The gadget comes with a special charging cable, whose front end attaches to the watch with a clip, while the other one is a socket for plugging in standard charger for Sony Ericsson’s handsets. It takes the MBW-100 about 1 hour and 10 minutes to charge from empty to full. On a couple of simultaneously received incoming calls, handset might lose connection with the watch, forcing you to wait until it re-establishes connection automatically, or initiate search from the MBW-100’s menu. Those keen on technical specifications will be pleased to know that the MBW-100 runs on hilips’s chipset (BO2031) with Bluetooth 2.0. To promote its latest solution, the company has come up with a dedicated portal, featuring a James Bond-like clip, that clearly positions the MBW-100 as a gadget aimed primarily at youth (girls won’t find it fitting due to dimensions and weight). The guideline retail price for most markets will make 300 Euro (in Russia – not less than 400 USD). Does this product offer enough of value for this much money? 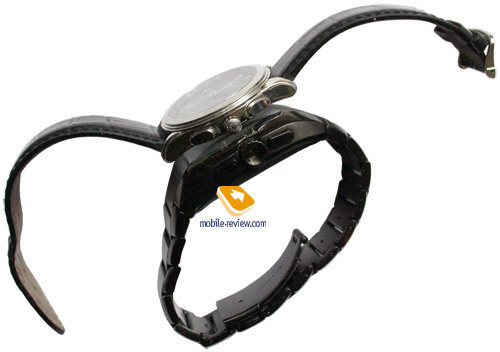 It is a question without a plain answer – watches coming from this class are not attention magnets and thus impress only with technical specifications, with Caller ID being the major one. This isn’t too much, although youth should find it suitable. All in all, it’s a solution for a certain niche, by no means aimed at the mass market. Its sales will prove to be significantly smaller than those of Motorola’s very own RAZRWire, even though that solution is not all the rage either. 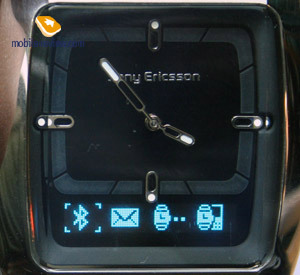 So, what’s the point for Sony Ericsson in releasing such watch? In some ways a PR move and attempt to attract attention to Bluetooth-accessories, you say? Definitely, the company has something like this on mind. But dig a bit deeper and think of the MBW-100’s nickname, hidden from the broad audience (all resources feature only the product’s index, even though on coupling the watch’s title pop up). What does “vanguard” mean? In the military sense of this word, these are the squads on the frontline. However on second thoughts, we can rightfully suppose that the watch’s dimensions were deliberately increased not for the sake of fashion or because they couldn’t miniaturize them (the MBW-100 could be at least two times smaller at the same feature set). 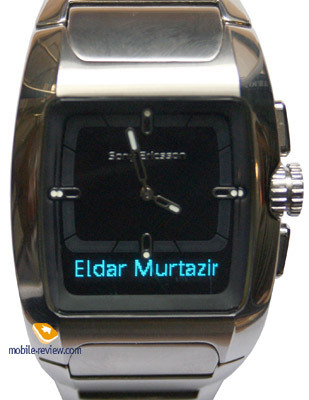 In fact, it’s a reserve for the future release of a watch model armed with GPS-receiver. Such devices have already hit the market, though they are almost out of demand, as it’s quite challenging to pack both receiving module and screen with maps for visual reflection of current coordinates and routes into a compact watch’s casing. Nevertheless bundled with handsets in 2008, these solutions will become not only possible, but vitally essential as well. Another option here is widening of the range with Walkman-watches, enabling users to check out information on played back tracks and offering more dedicated player controls. 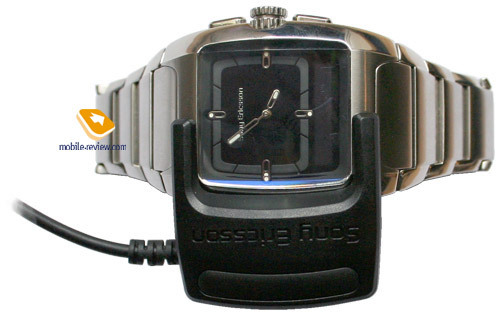 Furthermore, this watch is a desire to see where cooperation with Fossil will lead – in its turn, Sony Ericsson has handed over Bluetooth-technology to this company. 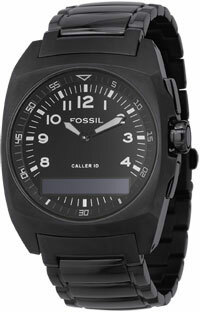 The best thing about Fossil’s watch (similar to the MBW-100) is altered watch-face, while all other specs are completely identical. 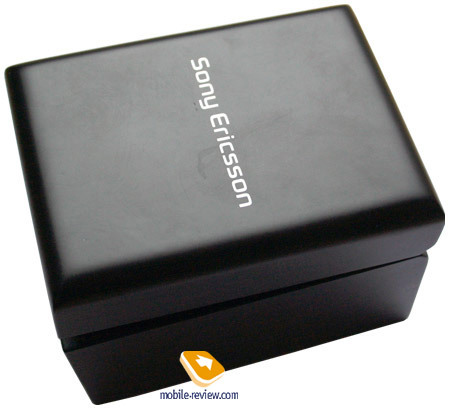 However, being an independent manufacturer, Fossil powered its product with support for handsets other than Sony Ericsson-branded ones, namely smartphones running on the S60 with Symbian 7,8, 8.1. Regrettably, most up-to-date top-notch devices are making use of Symbian 9.x. Another attraction of Fossil’s offering is price at equal feature packs –it makes about 250 USD (which is approximately 100 USD cheaper). So, there is always a choice which one to buy – generally speaking, these two products are of equal value.